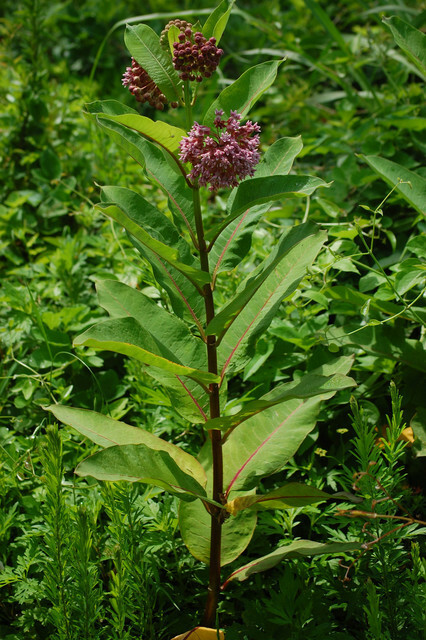 Asclepias purpurascens is a perennial herb to 1 m tall; stem erect, finely hairy, sap milky. Leaves opposite, stalk to 0.8 to 2.5 cm long, blade 10-15 cm long, elliptic to egg-shaped, finely hairy below, smooth above, base contracted. Flowers dark purple, to 1 cm, radially symmetrical (see A. syriaca); inflorescence umbrella-shaped, one or a few flowered, at top of stem; June-July. Asclepias purpurascens fruit. R. W. Smith. University of Michigan Herbarium. 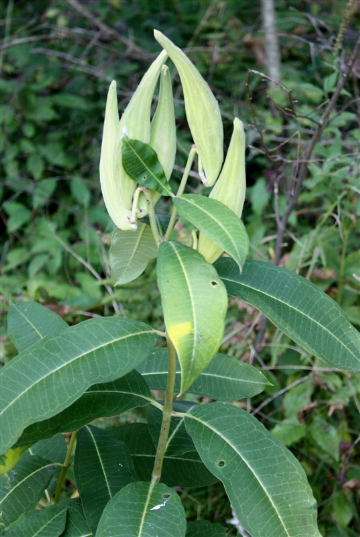 michiganflora.net (Accessed 10/2017). Fruit dry, hollow pods 10-15 cm, filled with plumed seeds, held erect, hairy but not warty. Habitat: Upland open woods, meadows.